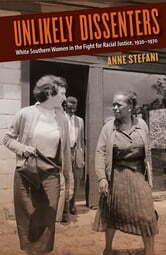 "An eye-opening account of southern white women who worked to challenge racial segregation. . . . Highly recommended." --Choice "Brings to life a small but important group of women who worked hard to change the South. . . . It will help to more fully explicate the motivation and experiences of women willing to challenge expected behavior in order to bring racial justice to the region and the nation." --American Historical Review "Stefani does a stellar job of chronicling southern white women?s confrontation with segregation and white supremacy. . . . A welcome contribution to the growing historiography of little-known civil rights heroines." --North Carolina Historical Review "An intriguing narrative of women whose lives were dramatically shaped by their work in such actions as the Little Rock Central High School desegregation campaign in 1957, the Albany movement in 1961, and Freedom Summer in 1964." --Journal of American History "Extensively researched. . . . A valuable resource for anyone studying white southern women, women?s civil rights activism, and women?s activism across race, religion, and time." --Journal of Southern History "Stefani redefines the proverbial 'southern lady' with a close look at over fifty white, anti-racist women. Concentrating on traits that linked these women across two generations, Unlikely Dissenters provides the first comprehensive study of how these southern women both employed and destroyed a stereotype." --Gail S. Murray, editor of Throwing Off the Cloak of Privilege "Presents a sophisticated and well-supported argument that women such as Lillian Smith, Virginia Durr, and Anne Braden challenged white supremacy at its core while knowing that they would be regarded as traitors to their race, region, and gender in doing so." --Peter B. Levy, author of Civil War on Race Street Between 1920 and 1970, a small but significant number of white women confronted the segregationist system in the American South, ultimately contributing to its demise. For many of these reformers, the struggle for African American civil rights was akin to their own complex process of personal emancipation from gender norms. As part of the white community, they wrestled with guilt as members of the "oppressor" group. Yet as women in a patriarchal society, they were also "victims." This paradoxical double identity enabled them to develop a special brand of activism that combatted white supremacy while emancipating them from white patriarchy. Using the 1954 Brown decision as a pivot, Anne Stefani examines and compares two generations of white women who spoke out against Jim Crow while remaining deeply attached to their native South. She demonstrates how their unique grassroots community-oriented activism functioned within--and even used to its advantage--southern standards of respectability.